IsaDora, Europe's best-selling cosmetics brand, has launched its summer make-up 2015 collection, inspired by a beach club. 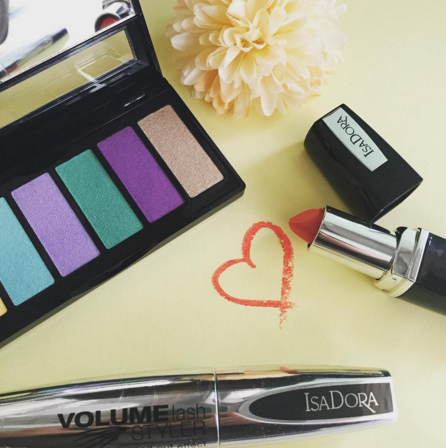 IsaDora Eye Color Bar Surf & Sun is THE must-have this summer with 6 colorful shades – both matte & pearly. All shades feature a delicate, soft and silky texture for a velvety feel and are easy to blend for a sheer to deep color. Mix and match with the soft glide-on Perfect Contour Kajal Waterproof in lavender or mint to create dazzling summer eyes. It’s summertime and we need color! Go for a really bold lipstick that makes your lips pop. Perfect Moisture Lipstick is not only richly pigmented and long lasting, it’s also really moisturizing and conditioning and it has a smooth creamy finish – perfect for sun-kissed lips! Choose between the chic summer colors: Watermelon, Orange Flash and Pink Kiss. Match your bold lips and bikini with nails in the same shades for a chic and trendy beach look. Choose between yellow Sun Ray, Ocean Dive turquoise, Summer Flirt lilac and Pink Glow. To complete your summer look. IsaDora has also created a Bronzing Powder for a natural sun-kissed look, a newly designed Bronzing Powder Brush ideal for bronzer application and the Volume Lash Styler mascara. The new mascara with its creamy thickening formula, volumises lashes with a fanned out effect. Boasting perfect separation, definition and extra lash length, this mascara is humidity resistant hence making sure lashes stay perfect in the summer. IsaDora is available at major retail stores such as Paris Gallery, Debenhams, Boots, and Lifestyle.